John Perry is exhibiting paintings of South African bids in the gallery of Shell House in Greenmarket Square. The works are of two kinds, scientific for the illustration of books such as Skead’s Sunbirds of Southern Africa and paintings which are made for the pleasure of the painter and of viewers who are interested in birds. It is now 47 years since Lord Grey of Fallodon published The Charm of Birds in which he spoke of the feelings aroused in many people by birds and this is something which John Perry catches to perfection, even in a manner derived from the 19th century or from classical Chinese painting. Among the outstanding paintings by reason of acute observation is that of two Cape Robin chats, the upper bird’s legs being a an angle characteristic of the species. This ability to catch and record the characteristics of species is to be seen again in the expression of the violet-eared waxbill and in the angle of the head of the red bishop bird while singing. It is seen again in the poise of the kestrel. But for complete pictures in the most modern manner one must look at the small painting of the grey-backed finch lark against a pink, argillaceous soil or at the painting of the spotted creeper with is spotted eggs and lichens. Nor does Perry shrink from associating spotted butterflies with his birds for in the picture of Klaas’s cuckoo and Cape white-eyes he introduces two fritillaries and their larvae, prey of these birds, a picture as telling as that of a group of Cape white-eyes searching for insects and their eggs on poinsettia. 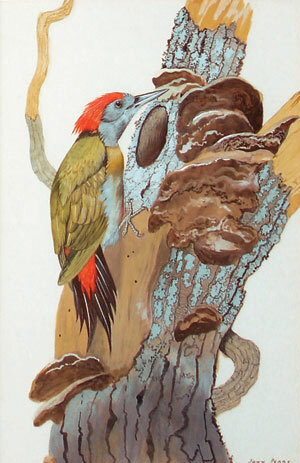 Two of the pictures in the Chinese manner, apart from that of the red bishop bird, are one of the malachite kingfisher and the other of a pair of paradise flycatchers. The picture of the malachite kingfisher poses the bird on a branch which makes a diagonal completed by its own reflection in the water.